This fascinating fortnight in Laos invites you to become part of a small group tour exploring one of Southeast Asia’s last remaining undiscovered treasures. Although Laos is not exactly off the beaten track it has still managed to retain much of its old-fashioned charm and original cultural heritage. Large modern developments and mass tourist crowds are relatively rare and as such you’ll get to meet local people who are still genuinely interested in sharing their country with wide eyed travellers. Buddhism is as significant to the souls of Laos locals as the Mekong River is to their pockets and this two week tour enables you to get to know both sides of the coin en-route from Luang Prabang to Champasak. 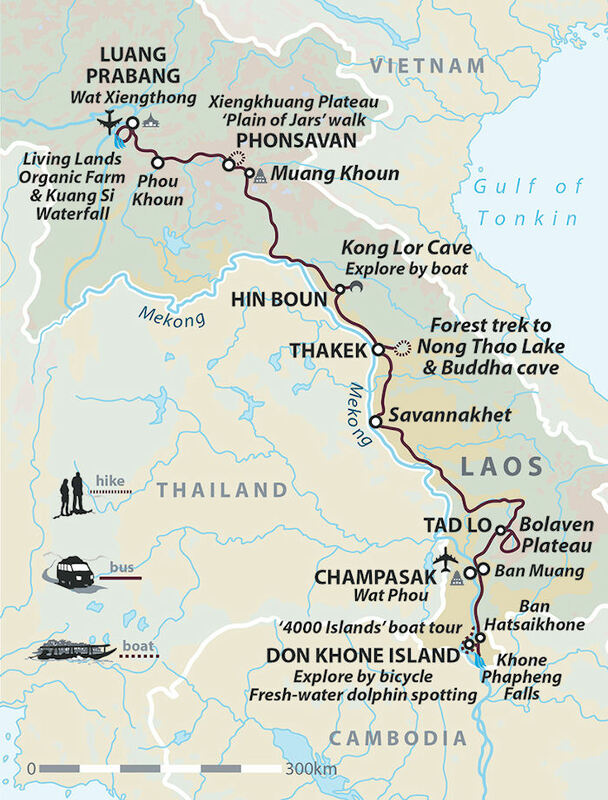 Laos is a laid back land of lush mountain slopes and incredibly scenic waterways with a little touch of French flair thrown in for good measure in and around the communities of Thakek and Savannakhet. This is a really unique cultural tour with the emphasis on discovery with newfound friends and a knowledgeable guide rather than going with the flow and returning home sun tanned yet culturally unenlightened. From paddy fields and agricultural plains to Buddhist iconography and amazing sites, such as the Plain of Jars, this is Laos as nature intended – way beyond the well-hoofed backpacker trail. In order to facilitate an enduring support structure for the communities we visit, and to show a commitment to these values, we have set up a charitable foundation through which we can channel funds to both existing NGOs and our own development projects. In addition to organising ethically sensitive cultural tours, having our own charitable foundation allows us to raise money – through the cost of our tours, charity trips and fund raising events – which can then be used to fund various projects in education, sanitation, reforestations and a number of other important issues facing developing communities. Wherever possible we are happy for our clients to visit these projects to see for themselves where and how this money is being spent. Et National Park. This incredible national park covers more than 11,500 square miles and is home to many endangered species such as tigers, leopards and white-cheeked crested gibbo - so it is vitually important to leave no rubbish behind that might affect these incredible creatures. Fees into this park go towards to protecting the jungle and it's inhabitants. During our trip, we visit local communities. Such visits not only help the communities financially but also break down boundaries over decades of misunderstanding. It will enable close interaction with clients and local people offering the chance to see how people live and learn about their livelihoods and culture through first-hand experience. Secondly and probably most importantly, you will be contributing directly communities and homes some of those most in need. On this trip to Laos we incorporate home-stays, locally owned hotels, restaurants and the services of guides into our itineraries. This ensures that money goes directly into the local economy and local communities benefit from tourism. Really difficult to pick one! Sunrise at Wat Phou, boat trip try the konglor cave, sighting the river dolphins and so much more. There are long bus mini bus rides along windy mountain roads which might not suit everyone, but these are unavoidable if you want to see the beautiful countryside. Incredible experience, definitely one of the most memorable holidays we have had to date.